Hdac Technology is a tech company under blockchain project 'Hdac'. Hdac is a hybrid blockchain platform integrating public and private blockchains and is designed as enterprise architecture to process diverse needs in the industry. Hdac Technology announced its plan to complete the development of SDK and API in the first quarter to build an enterprise solution developing environment and the framework. Specifically, Hdac will use the DevOps approach to enable fast and easy development, establishment, test, and distribution of Hdac-based blockchain infrastructure. CTO Moon-Ok Cho said, "We aim to help companies to establish and operate their own blockchain-based services with ease by providing BaaS(Blockchain-as-a-Service) solution. We are currently reviewing cooperation with a world-renowned cloud service provider to provide top quality enterprise blockchain services and to acquire a competitive edge in the global market." "Hdac Enterprise Blockchain Solution can be applied to various fields including construction, real estate, manufacturing, finance, and retail. We have completed two PoC(Proof-of-Concept) projects so far besides HERIOT, a blockchain-IoT converged smart home solution that we have already launched, and expect to win more than four actual projects during the first half of the year," he explained. Hdac Technology's FinTech business is driven under the initiative of HYUNDAI PAY, aiming to provide convenient daily cryptocurrency payment services. HYUNDAI PAY is a Korean corporation that has Hdac Technology CEO Michael Yoon and CTO Moon-Ok Cho as the CEO and the CSO respectively. The core of the FinTech business is Prepaid Point Payment Service. With the service, customers can purchase prepaid e-money called 'H Point'(tentative) with 'Hdac Coin' and use it for transfer, electronic payment at online/offline franchise stores, QR-code payment at retail stores, and utility bill payment on smart home service. CTO Moon-Ok Cho's further plan is to evolve 'H Point' into a stablecoin in the future. Real Estate P2P Service carefully selects investment-worthy real assets and provides investors with profits. In particular, it aims to provide a blockchain-based P2P platform that links with the Prepaid Point Service, enabling convenient real asset management and reinvestment to various forms of assets. It plans to expand the service into a total P2P Finance Service by broadening the spectrum of assets to cryptocurrency and more. In regards to the public blockchain sector, the development of Bridge Node that connects Hdac MainNet and a DApp partner's mainnet has been completed. It will be released by the end of March at earliest, after internal integration test and verification. 'Hdac Contract' based on the Bridge Node is designed with a focus on providing a DApp service that can issue tokens and be applied to diverse industrial environments. 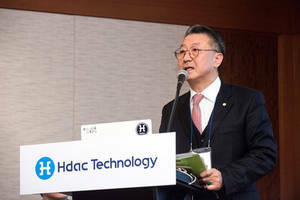 CEO Michael Yoon commented that, "Hdac Technology will provide all types of blockchain-related services to better assist customers in the era of the 4th industrial revolution by integrating upcoming technologies like IoT, AI, big data, and FinTech." He also added, "We are in dialogues with a globally renowned blockchain team to upgrade the current ePoW algorithm into a new blockchain protocol which suits the new era."